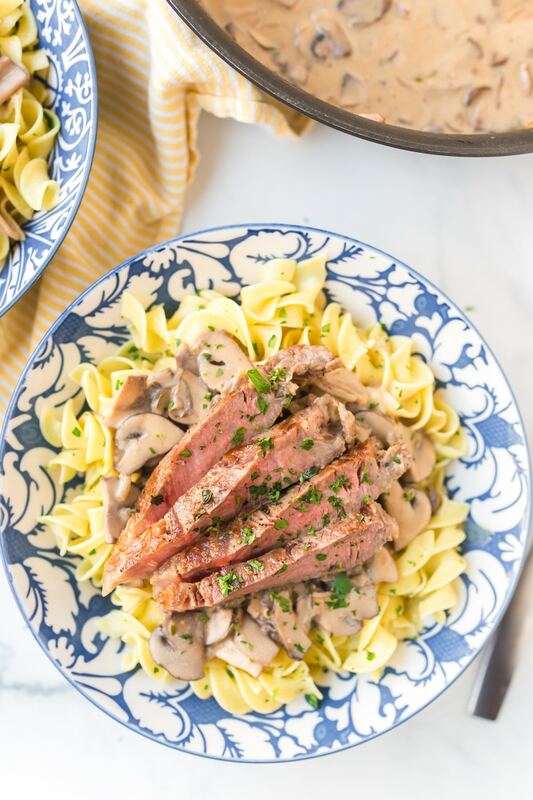 This Easy Beef Stroganoff Recipe with Butter Noodles is a speedy way to get your stroganoff fix. Plus it makes a marvelous holiday dinner! Sometimes I watch my daughter in wonder. She will decide that we are having “party night” and goes about the house making decorations, invitations, signs, and appetizers. She’ll even make or find little trinkets to put in goodie bags. Then after dinner, the rest of us are herded into the living room to join her party. Ava does this sort of thing regularly. She plans to play a board game and either pull out all the games and makes it an event, or spends hours creating a new board game. She chooses to play “restaurant” and turns our house up-side-down in order to design the perfect dining room and kitchen. She even makes room cleaning an elaborate affair! Where did she get this extreme all-or-nothing quality? Oh, yes… The finger is pointed in my direction. My parents would say I was exactly like that when I was little. We don’t cook a lot of heavy, starchy meals. It’s not that we don’t enjoy potatoes and pasta dishes. I guess I’m just always trying to compensate for the abundance of desserts in our house! However, when I do make a carb-acious meal, I don’t want to cut corners on flavor or fat. I figure, as long as you’re making a heavy meal… Make a HEAVY meal. The only area I am ever willing to cut corners on is time. My time is precious to me. Although I love to spend it in the kitchen, the more I do, the less imaginary parties I get to attend! This Easy Beef Stroganoff Recipe with Butter Noodles is a recipe I developed specifically for my original cooking class several years ago. The ladies always requested quick, fresh meals they could throw together once they got home from work. I took my slow-cooking traditional Beef Stroganoff recipe and revamped it for speed. The result? A full bodied, full flavored, all-or-nothing dish in a fraction of the time! What really speeds up this Easy Beef Stroganoff Recipe with Butter Noodles is the cut of meat. Most Beef Stroganoff recipes call for a lower-quality cut that needs to be slow-cooked to breakdown and tenderize. By simply using a better cut of beef, you cut out hours of cooking time! 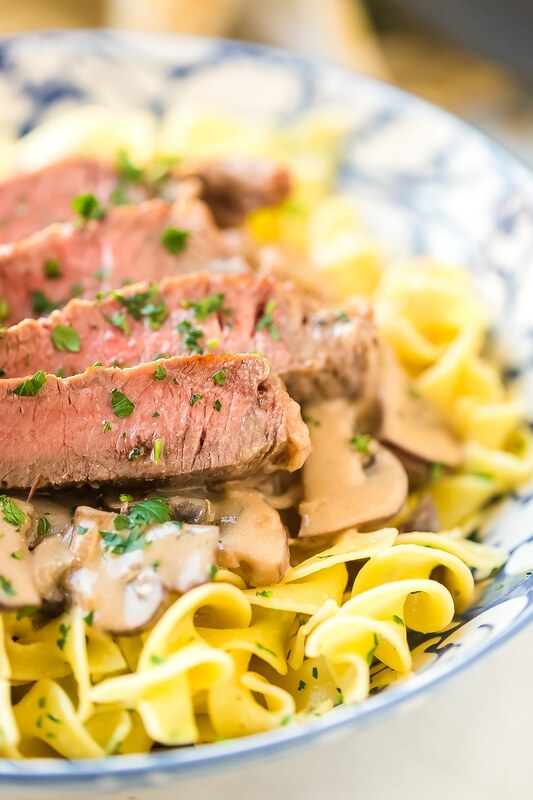 This Easy Beef Stroganoff Recipe with Butter Noodles can be made in less than 30 minutes if you’re a good chopper. Or you could buy pre-sliced mushrooms, I won’t tell. Note, I’m not a fan of the super thick gravy-like stroganoff sauce you find in some recipes. 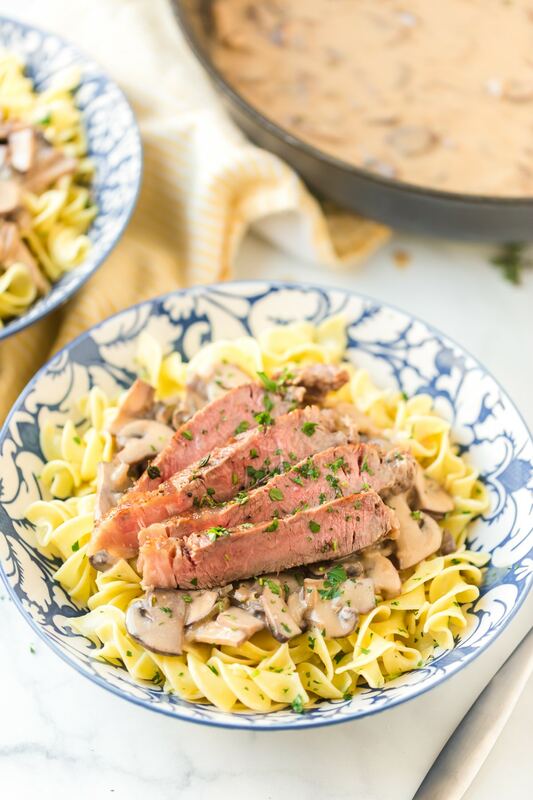 This Easy Beef Stroganoff Recipe with Butter Noodles includes sour cream to give the sauce a tangy note and silky texture but is not thick. If you love a thick sauce you can double the amount of flour used below. Easy Beef Stroganoff Recipe with Butter Noodles. 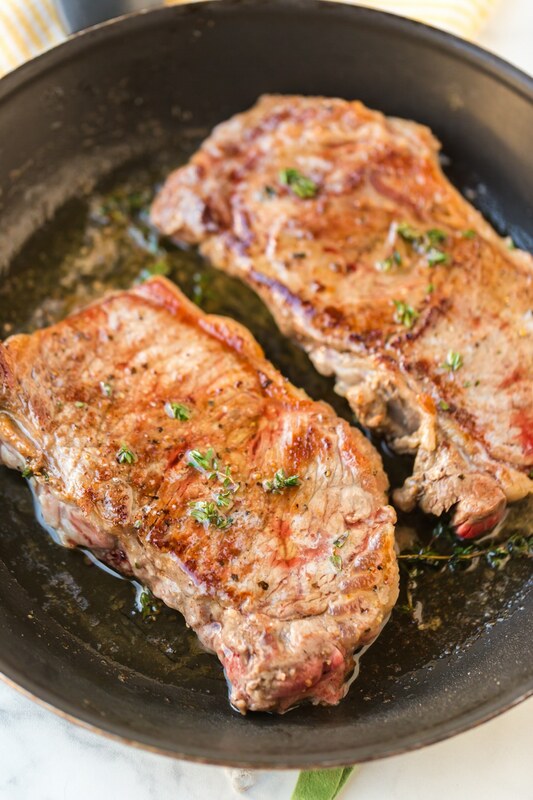 A fabulous main course for the holidays with a silky sauce and thick-cut steaks! 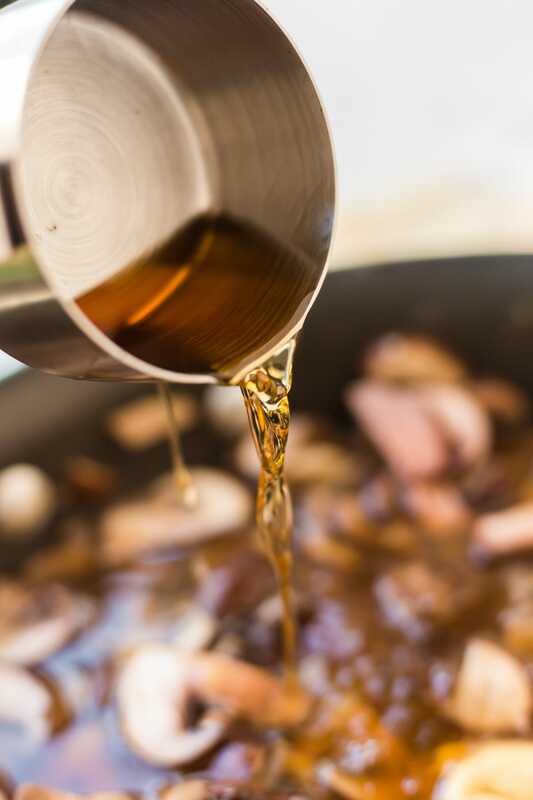 Place a large pot of water on high heat and bring to a boil. In a separate large saucepan combine oil, 2 tablespoons butter, and the flour over medium-high heat. Whisk well to eliminate clumps. Add the sliced onions and stir for 2-3 minutes. 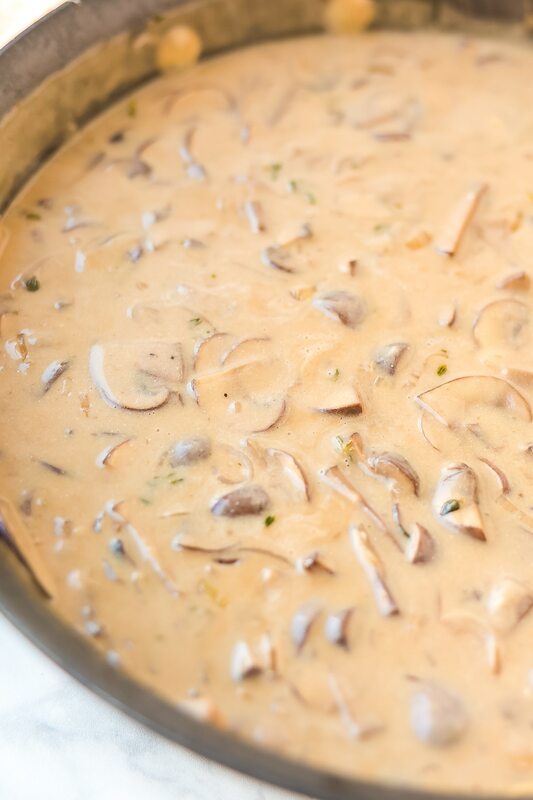 Add the mushrooms, garlic, 2 tablespoons thyme, and ½ teaspoon salt. 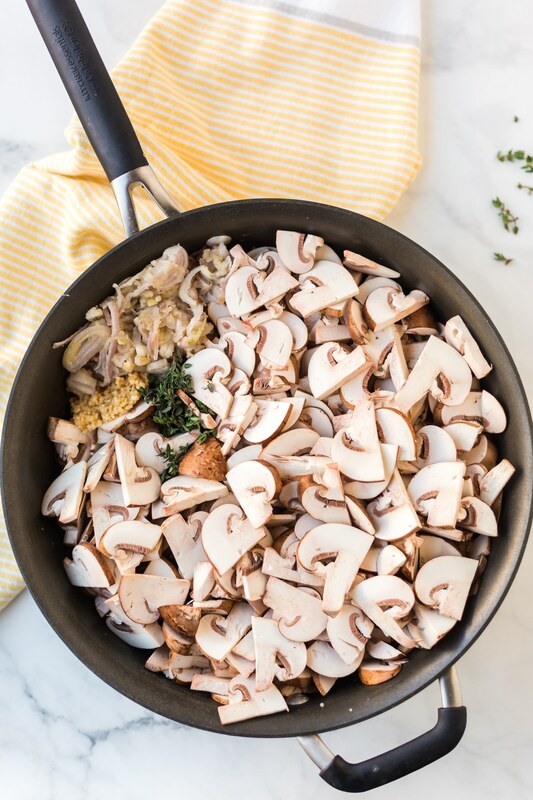 Move around the pan continuously for 5 minutes or so, until the mushrooms have started to soften. Then add cognac, beef stock, and Dijon mustard. Mix well, and let the sauce simmer another 10 minutes. Boil the noodles according to package directions. After draining, add 2 tablespoons butter, 1 tablespoon parsley, and salt to taste. Cover and set aside. After the steaks have rested 5 minutes, slice into thin strips. Add the sour cream to the sauce and whisk well. Salt and pepper the sauce to taste. Immediately plate the noodles topped with sauce. Then lay the steak across the top. Garnish with extra parsley! 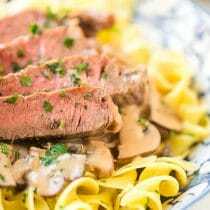 NOTES: This Easy Beef Stroganoff Recipe with Butter Noodles includes sour cream to give the sauce a tangy note and silky texture but is not thick. If you like a thick sauce, you can double the amount of flour.